What's New for the 2019 Nissan 370Z? Nissan has opted to continue making the Coupe, Roadster, and Nismo body styles in 2019 with some small improvements to standard options. All 2019 Nissan 370Z trim levels come standard with an auto-dimming rearview mirror and a rearview camera setup. The Heritage Edition is now available in Magnetic Black, Deep Blue Pearl, and Pearl White. All paint options can be outfitted with a variety of interior stitching options and colors. There are seven versions of the 2019 Nissan 370Z. 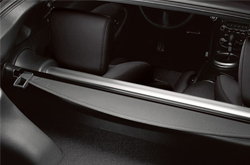 Below you will find features of each trim level. Also, you can contact us to find answers to any question you might have. Includes all 370Z features and adds Heritage Edition exclusive graphics, three paint options, yellowish interior patterns, and a limited edition leather steering wheel. Includes all features present in the 370Z model plus Viscous Limited-Slip Differential, 9" RAYS® forged wheels, sports brakes, SynchroRev Match®, and a Bose® Premium Audio System. 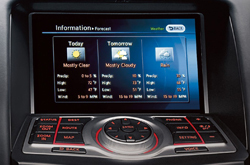 Includes all features present in the 370Z Sport model plus power heated seats, Nissan Hard Drive Navigation System, HomeLink® Universal Transceiver, and streaming audio. Includes all features present in the 370Z Sport Touring trim level plus a more powerful 350 hp, 3.7-liter V6 engine, NISMO aerodynamic body design, NISMO-tuned suspension, and NISMO forged wheels by RAYS®. The entry-level Nissan 370Z includes a 332-power, 3.7-liter V6 with your choice of a 6-speed manual transmission or 7-speed automatic transmission. It redlines at 7500 RPM, which makes for a more thrilling driving experience. The Continuously Variable Valve Timing Control System (CVTCS) technology under the hood of the 370Z makes for faster acceleration and a broader torque curve, without sacrificing fuel economy. Customers who wish to get even more performance punch, can opt for the NISMO model. 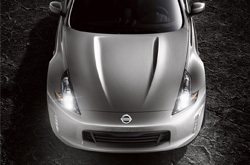 This is the most powerful Nissan Z® engine ever created. Under the hood is a 3.7-liter, 350-horsepower V6 engine with 276 lb-ft of torque. This model can reach 60 mph in 4.8 seconds. Nissan Intelligent Mobility monitors the road and helps the driver avoid unexpected situations. The standard safety features for all trim levels will keep you safe in the event of an unfortunate crash. 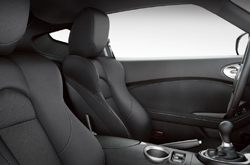 Here is a list of some of the safety features included on the Nissan 370Z.